It’s time for a WIP (Works in Progress)! There were lots of things going on in my studio this past week … from the making & photography of new tutorials, several custom orders, and a whole lot of experimenting it’s been a great week in Kater’s Acres Studio. From the photo above you can see that there’s been a lot going on in my studio, including some tears that were shed for a REALLY broken (and impossible to fix) ornament. I love WIP Wednesdays … not just because I get to show you my works in progress, but because I love seeing and hearing what others are doing as well. Here’s a brief look at what’s been going on in my studio over the past week. The Longest Day (Top Left): During a really long day in my studio (12+ hours), the 3pm hour caused me to have a severe case of the groggies! So, since I have a lovely coffee pot all to myself in my studio, it was time to engage in an afternoon mocha topped with whipped cream (because I deserved it). The Disaster Day (Middle Left): This caused major tears and a huge bummer moment for me. I made the crumbled Parker ornament you see above in several stages. On the final stage as I sat everything together and blended the final seams and joins, I wondered how I was going to bake this 3D cutie. Well … apparently you are NOT to bake it on a jar with Parker’s bottom through the “O” because if you do the weight is to great to bear, Parker falls into the jar, the ornament shatters in multiple places, and when it hits the tile, even the ribbon breaks! ARG! After this disaster, I closed up my studio for the day. Custom Order Day (Bottom Left): I also spent an entire day working on custom orders for which this musical round ended up being part of an earring set. For those of you who are subscribers to Parker’s Clayful Tutorials, you will be receiving this project on the third Monday in December! 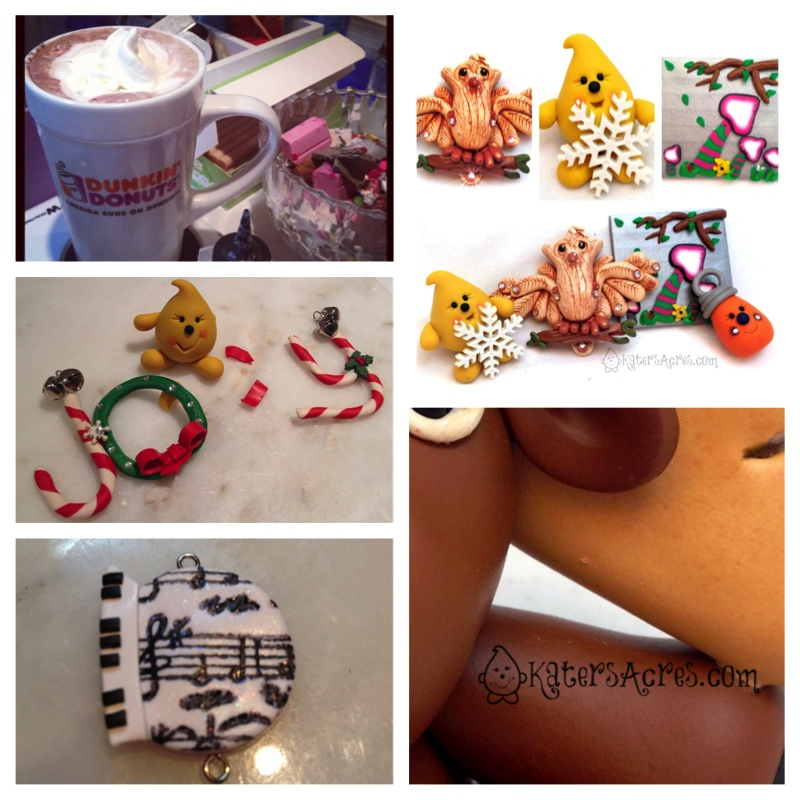 Ornament Swap Day (Top Right): Part of another day was spent working on my ornament swap for my partner. See that post and more details here. The owl & twinchie were the only things in the set that was already made. Sneak Peak (Bottom Right): This months PDF project will be sent to subscribers of Parker’s Clayful Tutorials on the first Monday in December. The project is done & photographed and the tutorial is being written as we speak. For those who are not subscribers, this tutorial will be $8.00 and released for purchase on December 3rd. Your first month’s subscription is just $5! The tutorial that is being sent on the first Monday alone will be sold for $8. This is a fantastic offer for your first month and it will be gone soon. Subscribe today! How about a fox or wolf tutorial? Please. Such a bummer about the crumbled parker. I would be so sad. I am currently working on some beads for necklaces. I made a cane which looked horrible and I was just going to scrap it. I reduced it cut it a couple times and combined it again and salvaged it and made some cool looking beads with it. So the day ended happy. It broke my heart Victoria! I cried over it … so much time and impossible to fix. I usually turn my “bummer” canes into kaleidoscope canes. I like the way the turn out when I do that. I’m so glad you were able to salvage it. I can’t wait to see your beads & necklace!